Memorial Day is a day we honor those who have died in service to our country. So why do I post one of my mother's wedding pictures? I know, it is blurry, but I do not have the energy to sort through all of the boxes of Mother's pictures to find a better one. So, why do I use this picture for Memorial Day? My parents were not married on Memorial Day and my father survived World War II. You have probably figured it out by now. 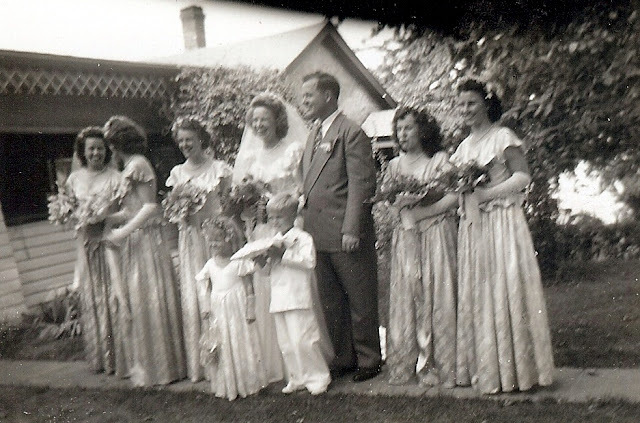 The little boy, the ring bearer, was my mother's cousin. He served in Vietnam and did not return. I am posting a newspaper article that state the facts. The facts are secondary to the family, though. I have to admit that Bobby and I only saw each other a couple of times a year (if that) while I was growing up. It was a long six to seven hour drive to visit my mother's side of the family. He was nine years older than I, so we really did not hang out together when we would visit. I do remember that I had admired him. He was always kind and put up with his little cousin. I am sure, that at six years old I could be quite a pest. By the time I was ten, Bobby was in college and later got married. My grandmother kept us informed about all of the aunts, uncles and cousins through letters that she sent us at least twice a week. So, when we received a call from her on a February evening in 1968, we knew it was bad news. Bobby was missing in action. Missing in action? He was a pilot and his plane was shot down February 14th. My grandmother told us that the same thing happened to her when my uncle was missing during WWII for a few days. We all hoped that we would hear good news about Bobby, maybe he parachuted out of the plane and would soon be found. Missing in action has no ending. Each letter we received from my grandmother ended with these words, "Still no news about Bobby." I often would open her letters before my parents got home and would just go to the last page hoping to see a different message. But I knew that if there had been good news we would have gotten a phone call. When the Viet Nam Memorial was built those who were missing in action were noted with a plus or cross sign (+) after their names. Bobby's name is engraved on the wall, Panel 39 E, row 6. A plus sign was next to his name...missing in action. Year after year...missing in action. 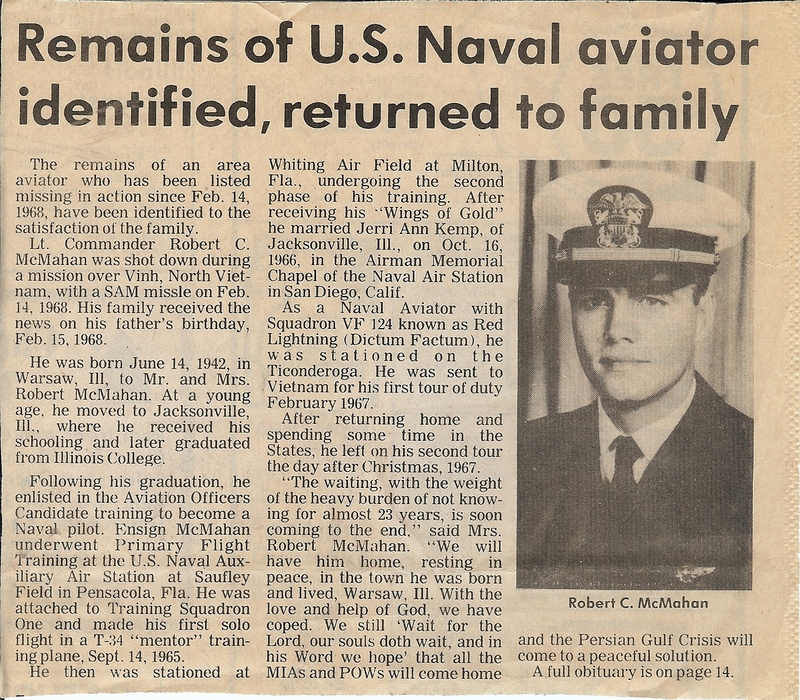 When my grandfather died, Bobby was still missing in action. My grandmother died and still....missing in action. No end, no answer. My father died, still no word. Was he alive? Was in a prisoner of war? If he was alive, what was happening to him? No end, no answer...missing in action. I often wondered, "If I am feeling this way, how are Bobby's parents and brother and sister, and his wife feeling?" I could not imagine the sadness. When the war was over, Bobby did not return. Bobby was not among the prisoners of war. Bobby was....missing in action. War is cruel and this is the cruelest. Nearly twenty three years later, Bobby's parents received word that his remains had been recovered. On November 29, 1990, U.S. officials announced that remains repatriated in September, 1990, had been positively identified as those of Robert C McMahan. After 22 years, McMahan had come home. Now the grief could begin. No more wondering, no more hope. But now the truth, no matter how sad. When the remains of a Missing in Action soldier are found, the plus sign on the Memorial Wall is filled in to look like a diamond. Now Bobby's name has a diamond shape after it. On this Memorial Day, I honor my cousin, Bobby, and all of the other men and women who have died or are missing in action in the service of our country. One death touches so many, not only immediate family members, but also pesky little cousins. The article below tells the facts and also touches on the sadness of the family. Here are some links with more information about Bobby.